Pirates Bay lies to the eastern side of Eaglehawk Neck and runs the full length of the coast, like a gigantic letter “C”, from Clydes Island, at the northern end, to Fossil Island, beyond the famous Blowhole. Beyond Pirates Bay is the Tasman Sea, with the next land being New Zealand over 2,000 kilometres away. The Great Southern Ocean and Pacific Oceans lie beyond, so some quite severe and spectacular seas can be seen in Pirates Bay at times – particularly along the sea-cliffs near the Blowhole, Tasman’s Arch and Devil’s Kitchen. Pirates Bay offers something for everyone. The section from Egg Beach, in the middle of the bay, to the northern end of the bay near the ‘Neck’ frequently provides great surfing conditions , making it a very popular beach with surfers and boogie board riders. The southern end of Pirates Bay features Descent Beach, a sandy beach that is sheltered by Fossil Island jutting northward beyond The Blowhole. 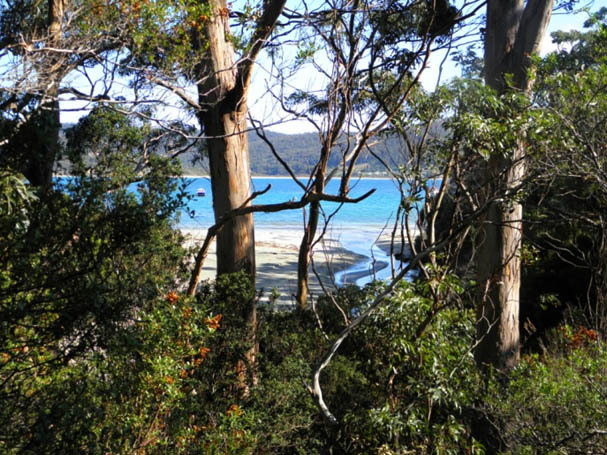 It provides a safe place for even the youngest of children most days, particularly around Blowhole Creek where it flows into the bay. Photo: Arthur orchard – Blowhole Creek flowing into Pirates Bay, taken from Blowhole Road. 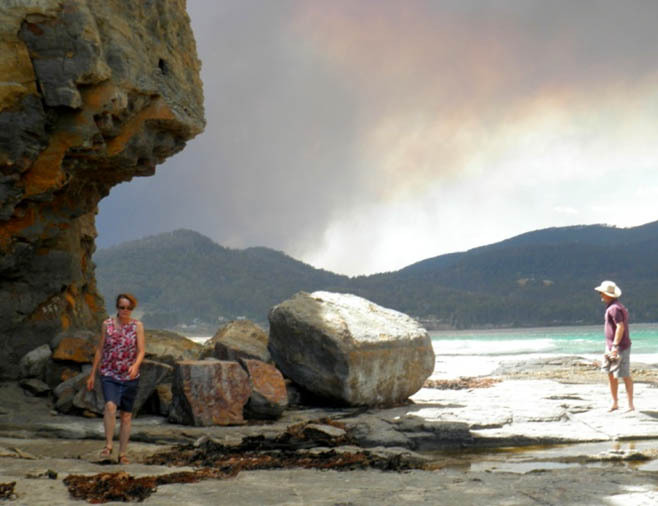 In between the surf beach at Eaglehawk Neck and Descent Beach is Egg Beach and several other short beaches; each hemmed in by weathered rocky outcrops that protrude into Pirates Bay but do not prevent access for a very pleasant walk.